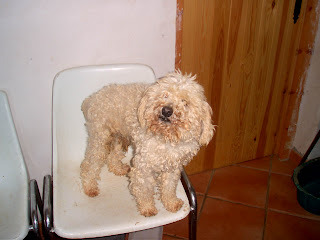 Nelson is a poodle cross and has been at the refuge for many years. His owner died and there was no one to care for him so he came to the refuge and will stay for the rest of his life. Like all poodles his hair needs to be clipped regularly which he does not enjoy! He has a nervous problem in which he throws his head back and howls when excited which has meant he has been difficult to re-home.. He likes to be up high and can jump onto tables with little effort! He is a great favourite at the refuge and gets into the house at every opportunity..
Like most of the dogs here he loves cuddles and will do anything for attention! Please help Nelson and his friends..
All donations, however small, will go towards the feeding and care of the dogs! It's easy to help, just click on the DONATE button top right.